A LAMP (Linux, Apache, MySQL, PHP) stack is commonly used to prepare servers for hosting web content. In this guide we will show how to install it on the CentOS 6 version. Unfortunately, we do not provide technical assistance with VPS/dedicated servers without cPanel. However, this detailed guide will be handy if you are planning to manage the server without cPanel installed. All commands should be performed under root access on a 'clean' operating system. VPS packages come with pre-configured LAMP image by default, and you need to bypass 2-4 steps and continue with adding the website. 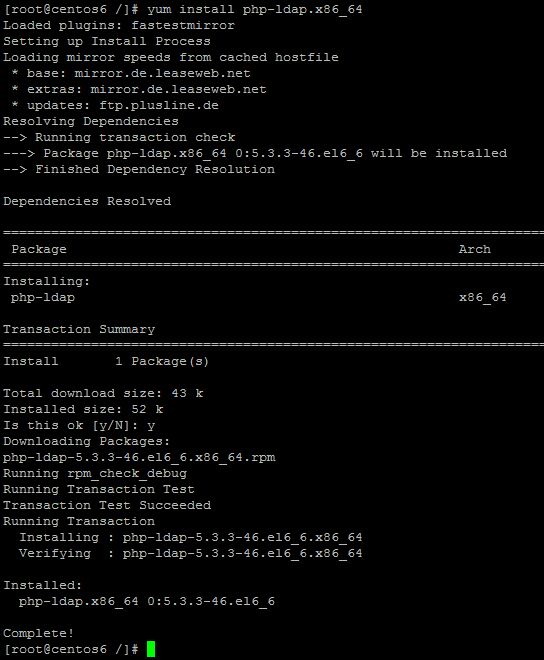 If you need to upgrade the default PHP version, this part will be useful too – Changing already installed PHP version. In this case, it is better to upgrade a 'clean' installation passing all steps. Update the operating system to the latest version using the yum update command. You may also want to change the default root password provided in the Hosting welcome email. Make sure that the password is secure enough, and you keep it in a safe place. The hostname should be some subdomain you do not plan to use for the website. By default, it is set as server1.yourdomain.tld, but you can change it anytime using SolusVM panel for a VPS or IMPI for a dedicated server. The password change is done using the passwd command. In this example, we are planning to build the http://nctest.com website and our hostname is server1.nctest.com. At the moment, default CentOS 6 repositories include the PHP 5.3.3 version. However, this PHP version is already considered to be outdated, the up-to-date version is 5.6. We suggest checking scripts you are going to install to consider what PHP version you need. Also, the installation of a 'fresh' PHP version is different from changing an existing one. If there is no PHP support on the server, you should see command not found, so you can use install PHP from the scratch ("no PHP version pre-installed" options). Otherwise, use the last option to change the current PHP version. Now, when checking with the command yum search php, we find that we've installed new PHP packages like php54w, php55w, php56w and even new php70w. The same for other PHP versions which will be relevant to both CentOS versions. Note that it is quite risky to perform such an upgrade on the existing production server. It is much safer to try how it works on some test server or perform a PHP installation from scratch on a fresh install instead. 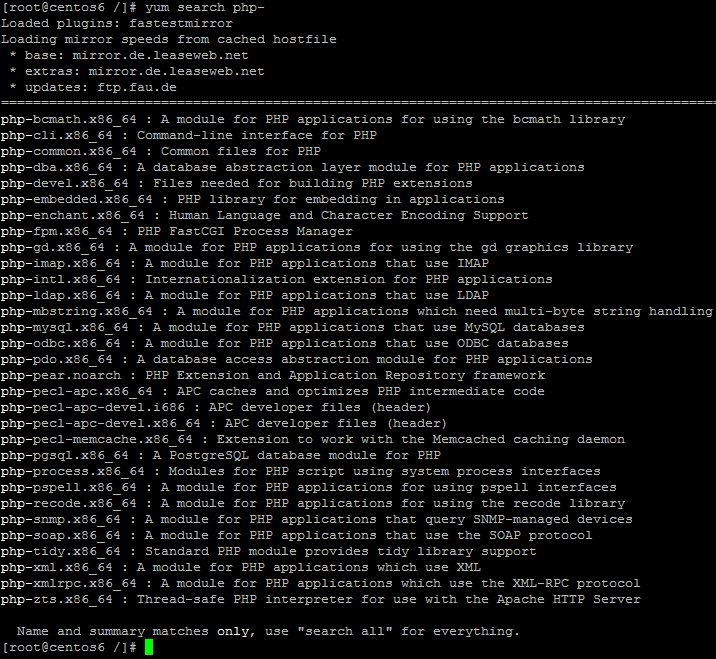 Again, you can check the installed PHP version using the php -v command. This time we need to edit the main Apache configuration file and finally start it. We will use nano text editor, but you can use any other of your choice. Use keyboard arrows to scroll down the file. The section we need is Main server configuration. Change two lines: ServerAdmin and ServerName. Do not forget to save username and password. You will need them to connect your website to MySQL database. 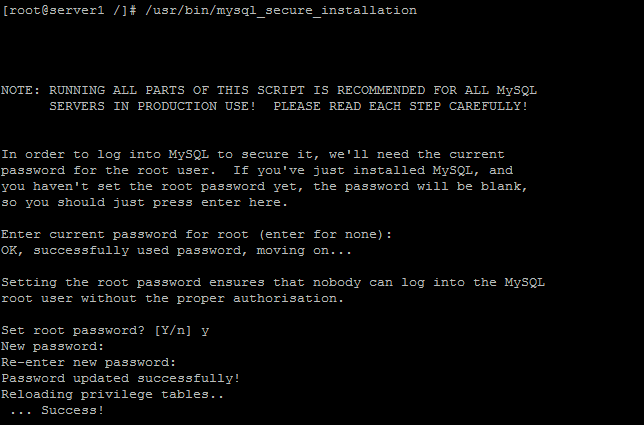 Type quit to close MySQL console. Basically, we need to create a folder to upload a specific website's files and tell Apache where specific host files are located. Replace 'domain.com' in each command listed below with your actual domain name. In the example below we are using the nctest.com domain name. The Apache configuration file is huge, next we need to modify only the part called VirtualHosts (end of the file). You can hit Ctrll+V to jump to the next page, Ctrl+W combination allows searching. 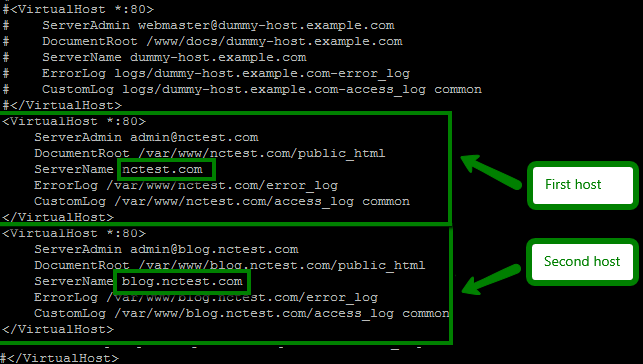 First, you need to uncomment #NameVirtualHost *:80 part marked in the screenshot, just remove # sign. We see the example on how virtual hosts file should look commented. Add the same lines, but without the comment symbol (#) at the end of the file and modify them with your details. 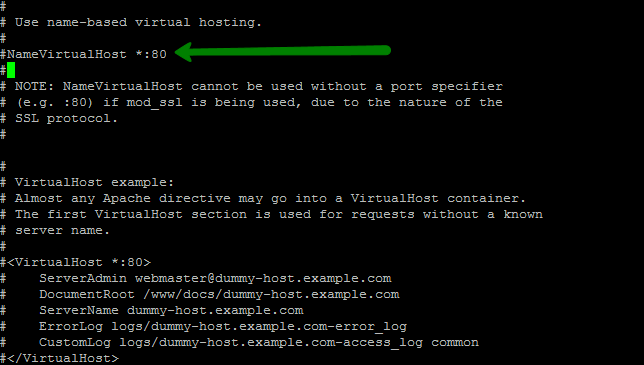 <VirtualHost *:80> means that any IP address going through port 80 will be a virtual host. In case your server has more that one IPs, you can replace the * symbol with the server IP you wish to set for this website. 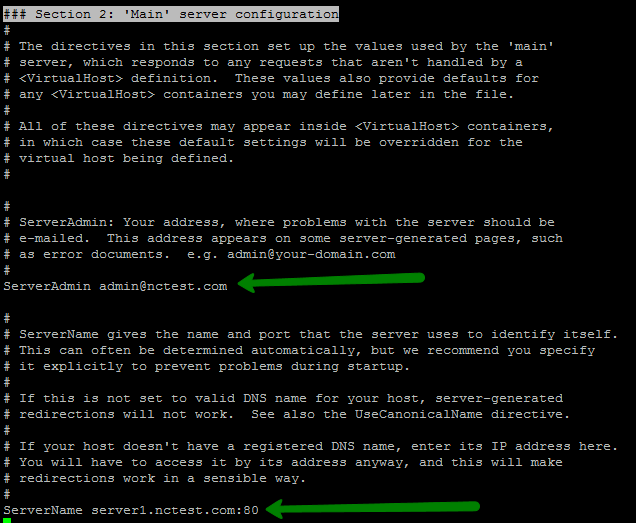 ServerAdmin – sets the contact address that the server includes in any error messages it returns. Now hit Ctrl+O on your keyboard to save followed by Ctrl+X and Enter to exit Nano editor screen. Then you can access your website at the link like http://nctest.com/wp-admin/setup-config.php and complete the installation by filling MySQL database details.